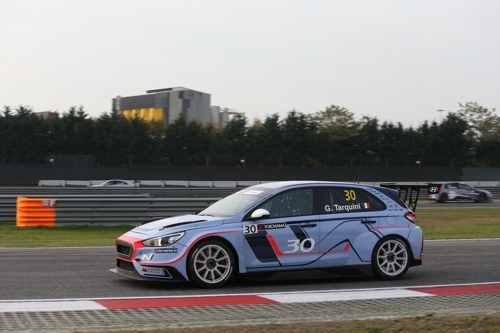 SEOUL, Oct. 30 (Yonhap) — The i30 N TCR, Hyundai Motor Co.’s purpose-built circuit car, beat rivals at the TCR Europe Trophy race held in Italy, the carmaker said Monday. In the circuit event held at the Adria International Raceway from Oct. 27-29, Hyundai’s i30 N TCR outpaced such vehicles as the Audi RS3 LMS and Volkswagen’s Golf GTi, Hyundai Motor said in a statement. The win comes weeks after the i30 N TCR beat the same rivals at its TCR International Series debut held in China from Oct. 6-8. After upgrading the high-performance car based on data earned from the TCR, Hyundai said it plans to sell the race car model to international professional racing teams later this year. The i30 N TCR was developed from the conventional i30 N, a high-performance car powered by a 2.0-liter gasoline turbo engine. It completed a grueling 24-hour endurance race in Germany in the past two years and comes with a six-speed sequential gearbox that doles out 330 horsepower, the carmaker said. That is breakthrough guys, a complete breakthrough! WHAT AN AMAZING POST ADMIN THANKS . An intriguing discussion is worth comment. I think that you ought to publish more on this subject matter,khatrimaza it might not be a taboo matter but generally people don’t discuss these issues. To the next! Kind regards!! In the wake of updating the superior auto in light of information earned from the TCR, Hyundai said it intends to offer the race auto model to global expert dashing groups in the not so distant future.